Kids can get a little loco over trains. 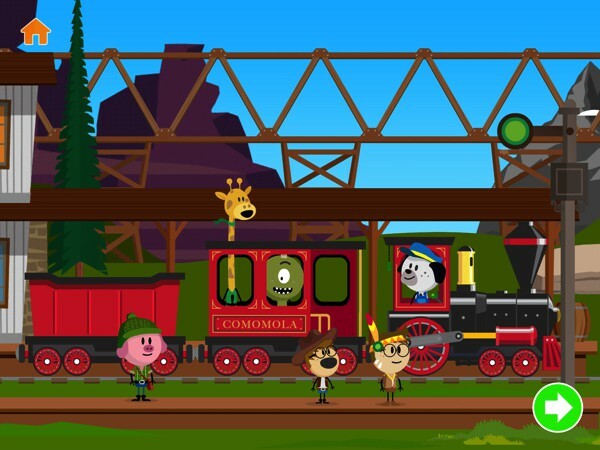 If yours do, here's a fun app to get them rolling: Comomola Farwest Train. As the name suggests, it's a virtual train set where kids can go on amazing adventures through the Wild West. In Comomola Farwest Train kids hop aboard Lou the dog's steam train at the station. The Station Master then appears and asks them to pick up certain passengers or items. These passengers and items may appear at different stations alongside other items, so kids will need to flex their brain muscles and try to remember which item they need. To move the train, kids simply tap on the right side of the screen. As the train chugs along, they can enjoy a wide range of landscapes and locations, from scorching deserts, snowy mountains, lush pine forests, mysterious mines, stunning canyons, and many more. They can also enjoy different weathers (shine or snow) and time of day. Interactive animations pepper the landscapes, creating lively and magical sceneries. The journey goes smoothly, though from time to time kids will need to help Lou remove various obstacles from the track. With a tap of their finger, they help Lou break giant rocks, hatch Eagle eggs, or drive away a flock of sheep. Once the train stops at its destination station, the Station Master will check if kids have picked up the passengers or items she requested. They will earn a star for each successful pickup, but there isn't any punishment even if they forgot. Afterwards, the journey starts all over again with new sceneries and surprises. Comomola Farwest Train is perfect for ages 2-5 years. The app is simple to use, to the point that you can play using just one finger. There is no reading required. As always with Comomola Apps, there are no in-app purchases or third-party adverts. Comomola Farwest Train works without an Internet connection. Kids with an affinity for trains will love Comomola Farwest Train. For a simple game, it offers plenty enough bells and whistles to keep kids engaged for a while. The landscape, passengers, and items are randomly generated, so no two journeys are alike. Little ones are bound to revel in the funny details along the ride, such as the aliens in the Native American get-up, cactus plants that play music, brave explorers riding in mine carts, and many more. Though the app is mostly for fun, it also helps kids exercise their brain for a bit. I would love to see more problem-solving activities incorporated into the game, for example, repairing the train by playing simple puzzles. Overall, though, the app is lovely as it is. 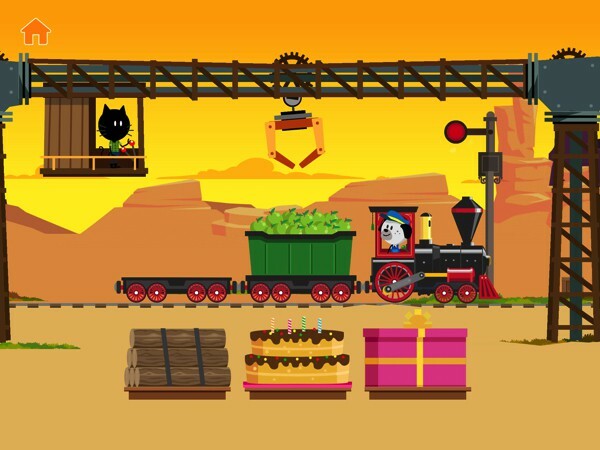 Comomola Farwest Train is a terrific train simulation game for little kids and train-lovers in general. It's simple to use, and kids should have no problem figuring out what to do. Because the sceneries are randomly generated every time, the journey is never boring. Kids also get to flex their brain a bit by completing missions and performing simple tasks. Kids sail the seas in search of treasure and exciting adventures in Comomola Pirates. This vibrant app has a relaxing gameplay filled with silly interactions, musical moments, and other toddler-friendly entertainment. It’s easy to use, and it has great graphics and nice music. All in all, it’s the perfect app for toddlers with a sense of adventure and a head full of imagination. Comomola Fireflies offers interactive stories that help kids overcome their fear of dark with silhouettes, soft lights, and calming routines. It makes bedtime less scary for kids and less frustrating for parents. Highly recommended for ages 2 and up.